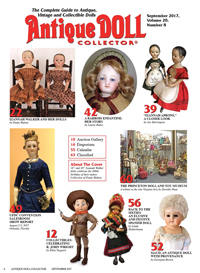 This category is for pictures of and information about antique dolls made by Izannah Walker. Both sisters are dressed in long sleeved brown dresses, made from antique fabric. 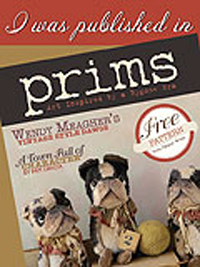 They will come with an antique petticoat, pantalettes and a chemise made from antique fabric, Two brass brooches, one at the neck and a slightly smaller one at the waist, and a tiny pincushion. 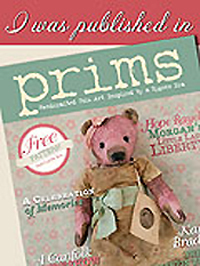 The pincushions are like the ones shown in the American Girl’s Book by Miss Eliza Leslie, although they are a traditional form that dates back at least to the later part of the 18th century. Their dresses were made using a pattern taken from an original Izannah Walker dress, and are perfect for gardening since the long sleeves protects the girl’s pale skin from excessive sunlight and the practical brown fabric does not show dirt. ❤ Yet the dresses look sweet enough for a party with the addition of a few accessories. The dolls are $1575.00 each, which includes free insured shipping to any U.S. address, with no sales tax unless they are shipped to CT. 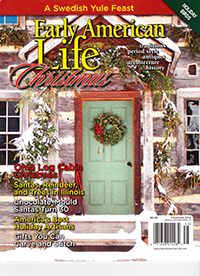 They are being sold on a first come basis and will be ready to ship out at the beginning of next week. Paypal, check, money order, credit cards and lay-away accepted. 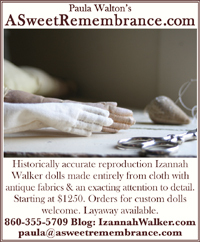 Please email p.walton.asweetremembrance@gmail.com to purchase or with questions. I’ll go by the time I receive your email if more than one person asks to buy the same doll. One of the truly amazing things about the reproductions of Tilly Lamb is the paint surface. All of her gentle wear and age is present in her new sisters. It’s hard to show you just how amazingly detailed it is…. Fortunately Eliza Jane had thought ahead to just such an eventuality! She had the parlor clean and a fire burning in the stove to help ward off the chill rainy weather. The dolls have been very busy out in the gardens for the past few months. They are hoping that the rain will hold off long enough for them to enjoy one last garden party with all the remaining summer flowers & produce from the gardens…. The dolls share their potting shed with the bees, who are happy to provide the little painted cloth girls all the honey they need to sweeten their tea, in return for the all the flowers that the dolls have planted around their skep. One of Izzybelle’s chores is to pick the tomatoes. Isane is all ready for a hard afternoon’s work. Would you like to take a garden tour while we wait for the party to start at 4:30 pm Eastern Time? 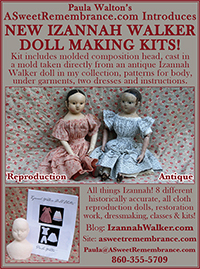 I’m so pleased that you’ve come by to join us today as my dolls and I celebrate doll maker Izannah Walker’s 201st birthday ❤ It is quite an occasion here in my studios and in the doll’s house. We consider Izannah’s birthday to be an annual holiday, on par with the 4th of July, Labor Day, Halloween and Thanksgiving! The dolls all look forward to it with great anticipation. If you’d like to look back at some of those previous birthday posts you may use the “search” box or “archives” search by month. Here is a sampling of some of them… I’m not listing them ALL because there were often multiple posts for each birthday party. https://izannahwalker.com/2010/09/25/happy-birthday-izannah-walker/ https://izannahwalker.com/2011/09/25/happy-194th-birthday-izannah/ , https://izannahwalker.com/2012/09/20/izannah-walker-birthday-sale/ , https://izannahwalker.com/2013/09/25/happy-196th-birthday-izannah-my-celebration-sale-starts-now/ . There are 4 posts for 2014, this is one of them https://izannahwalker.com/2014/09/25/a-birthday-picnic-happy-birthday-izannah/ . Nine birthday posts in 2015!!! This is the last one for that year – https://izannahwalker.com/2015/09/27/happy-198th-birthday-izannah-walker-part-9-in-which-we-come-to-the-end-of-our-story-say-farewell/ . Seven birthday posts in 2016 – 🙂 https://izannahwalker.com/2016/09/25/happy-199th-birthday-izannah-walker-part-4-blow-out-the-candles/ . Last year, in 2017, there were also 7 birthday posts, many with videos – https://izannahwalker.com/2017/09/25/happy-200th-birthday-izannah-walker-part-6-the-ice-cream-has-been-eaten-the-presents-have-been-opened-and-we-have-come-to-the-end-of-a-perfect-day/ . I hope you enjoy looking back at these and other posts here at my Izannah Walker Journal! Good Morning! Our party day greeting @ 8:30 am Eastern Time. Getting the Gardens Ready for the Party ❤ A glimpse of how the dolls have been preparing for their garden birthday party and an informal garden tour @ 12:30 pm Eastern Time. Party Time! Welcome to Our Garden Party! A look at last minute party preparations, meet all of the party guests and a sumptuous garden tea and delicious birthday cake @ 4:30 pm Eastern Time. New Dolls Available for Sale ❤ An unveiling of my latest works, sold on a first come basis. Posted for sale @ 8:30 pm Eastern Time. 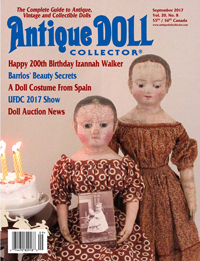 c. 1865 Izannah Walker doll, originally owned by Maude Rouse of Central Falls, RI, was sold at the Withington auction on April 12th, 2018. I had the privilege of attending the auction and seeing Maude Rouse’s doll in person. It was a wonderful experience which I’d like to share with you. I hope you enjoy seeing the photos of this outstanding doll, which now lives in a very loving home with her third owner ❤ I can not imagine a better place for her to be! 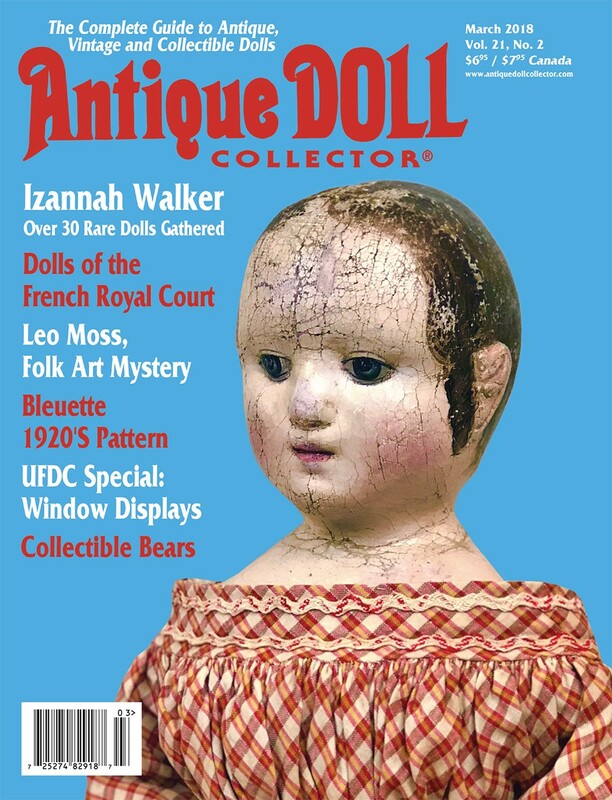 c. 1865 Izannah Walker doll sold at Withington Auction 4/12/18. Photos from the Withington auction preview on 4/11/18. * Sometime between 1850 – 1853 Izannah Walker moved from Somerset Village, MA to Central Falls, RI, where she lived until her death on February 15, 1888. She died of consumption, now known as pulmonary tuberculosis, and is buried, alongside her best friend Emeline Whipple, in Swan Point Cemetery in Providence, RI, which is not far from her home in Central Falls.